I have been trading the FTSE 100 for many years, my work focuses on timing the short term / intraday moves. I developed some indicators to help me with my analysis which is based on Elliott wave theory. I use a directional indicator called BTI, two timing indicators, Top 20 Differential and 13-day BTI and a trend reversal indicator called 34-day BTI. Welcome to the best FTSE 100 trading strategy! When you join my traders community you will have access to my latest view on the direction of the markets, you will receive live updates, you will see my trades (posted live) and you can copy my trades. I trade FTSE 100, GBP/USD, S&P 500, cash, future and options. Some trades are intraday others are held for many days. I don’t use a stop loss, trades are protected with other trades (hedging). As a result I am always long or short and the trades are small (low leverage). This enables me to run losing trades until they turn into a profit. This is what I call a no stop strategy. To join the traders community you need to download the e-Yield app. Thierry Laduguie has 20 years experience in trading, he has been a mentor since 2004. In our live trading room (traders community) I discuss the markets, answer people questions and trade live. People use the app to be in constant contact with me, they get instant support from me at any time. We have two types of members; people who have their own strategy use the app to get my view on the intraday / short term direction of the FTSE 100 and the levels to trade. People who don't have a strategy copy my trades. I trade the FTSE 100 cash, futures and options, sometimes I trade GBP/USD and S&P 500 as a kind of hedge for my FTSE positions. Each time I trade I tell members what I do. I also give people some guidelines on money management, generally speaking we bet £1 per £2000 of trading funds. In this live trading room the priority is to trade safely, so if I think it's a bit more risky to trade I will tell members to bet less. With this strategy it is impossible to lose your trading funds. Safe trading is what you get. I also give my view on other markets that will influence the FTSE 100 like S&P 500 and GBP/USD. Register for your free trial. If you are looking for trading signals on the FTSE 100 with a stop loss and target, through our main website www.e-yield.com we offer daily reports and analysis on the FTSE 100 including intraday and swing trade alerts. 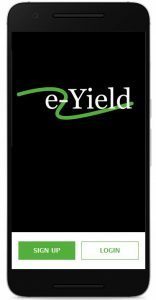 Click on the button below to visit e-Yield.com. No stop strategy or with stop loss?